Product categories of Clear Tarp, we are specialized manufacturers from China, Clear Tarp, Shade Tarps suppliers/factory, wholesale high-quality products of Painters Tarp R & D and manufacturing, we have the perfect after-sales service and technical support. Look forward to your cooperation! 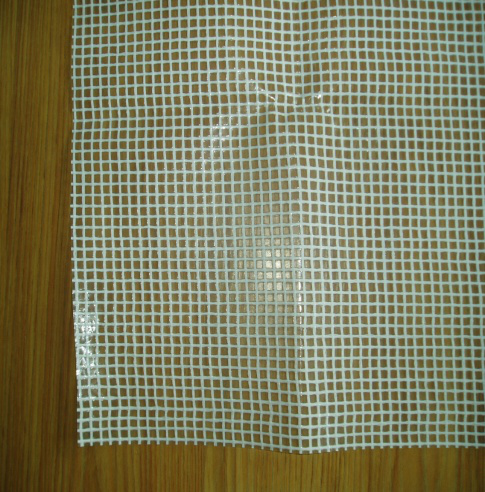 Clear Tarp also called Clear PE Tarpaulin, Clear Poly Tarps , Clear Tarpaulins, Clear Tarps, Clear Lonas, Transparent PE Tarpaulin, Transparent Poly Tarps, Transparent Tarpaulins, Transparent Tarps, Transparent Lonas, Semi-Transparent Tarpaulin, Semi-Transparent Tarps, Semi-Clear Tarpaulin, Semi-Clear Tarps, Clear Leno Tarpaulin, Clear Mesh Tarpaulin, Clear Scaffolding Cover, Clear Scaffold Sheeting, Clear Getapolyen, Transparent Leno Tarpaulin, Transparent Mesh Tarpaulin, Transparent Scaffolding Cover, Transparent Getapolyen, has two types of Clear readymade Tarpaulin Sheet and Clear Tarpaulin Roll, has a great deal of uses as Clear Greenhouse Covers, Clear Scaffolding Covers, Clear Awnings, Clear Camping Tent, Clear Tarp Canopy, Clear Temporary Shelters, Clear Heavy Duty Tarps, Clear Light Duty Tarps, Clear UV Tarpaulin, Clear Emergency Tarps, Clear Construction Tarps, Clear Waterproof Tarpaulin Covers, Clear Wood Covers, Clear Pool Covers, Clear Temporary enclosures, Clear temporary walls, Clear Tent sidewalls, Clear vapor barriers, Clear patio or porch enclosures, Clear Building enclosures, Clear Industrial Tarpaulin and more. Clear Tarp are with all Tarpaulins`common specification and could work like any other Tarpaulins. 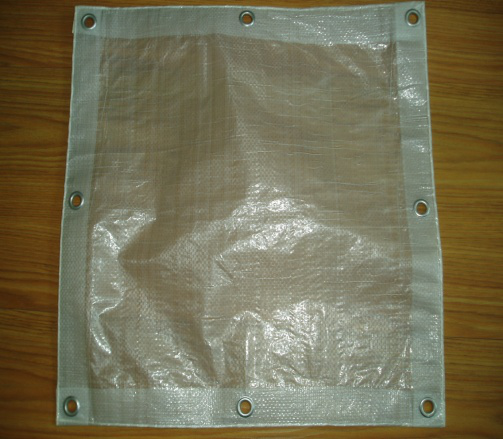 In addition, Clear Tarpaulin also has its own features, which allows light to penetrate and does not block sight, is ideal for any area where need waterproof material for protection meanwhile need light to through in, so is mainly used in below situation, is very popular in North America, Europe, Australia, Asia, South America, Middle East market, etc. 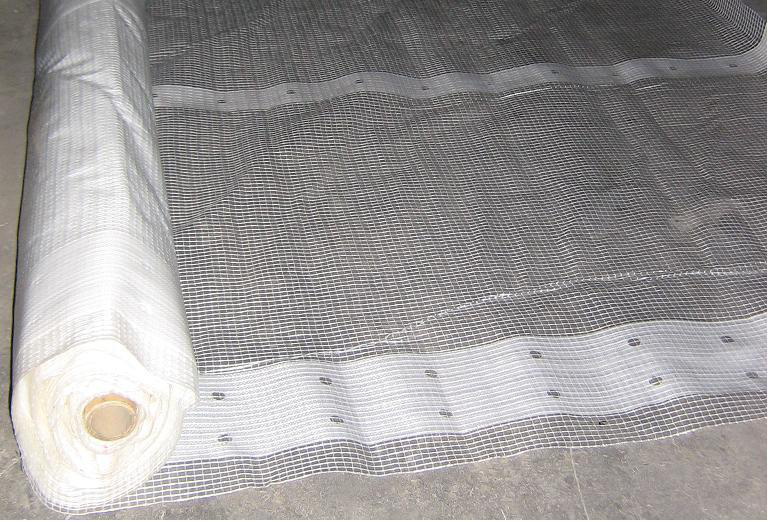 Clear Tarps could be a suitable cover for Animal Houses and Garden and Agriculture Greenhouse for plants, flowers, vegetables, fruits, crops, etc. It is perfect for protection against wind, rain, snow, frost , hail and all weather conditions, keeping temperature, at the same time, animals and plants can still get enough proper sunshine. Clear Plastic Tarpaulins are also used for Awnings, Canopy , Camping Tent and so on. As it provide optically clear view and allow light to pass through, People could see outside, feel sunshine and have good light inside. Clear Poly Tarps`another practical application is for store and outdoor stand. People are able to see inside commodities directly, it is helpful for sales promotion. 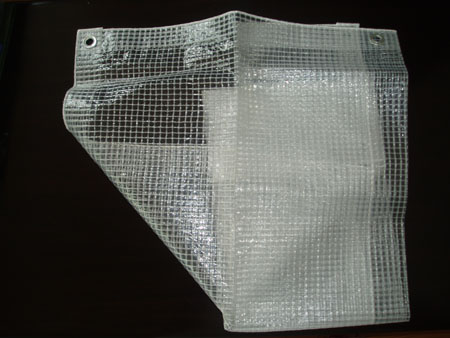 Clear Leno Tarpaulin or Transparent Mesh Tarp s or Clear Getapolyen or Transparent Scaffolding Cover work very well for construction projects. It is a protective cover on building to prevent accidents by falling objects to protect workers and pedestrians. It is a waterproof cover for weather protection, even under windy, rainy or other weather condition, workers still can work. It is see-through and with good light transmission, people could see inside and outside situation, inside work place have good light condition for workers. Any requirement for above Clear Tarpaulins and other Tarpaulins we supply pls do not hesitate to send us email and inquiry, Your contact are welcome !